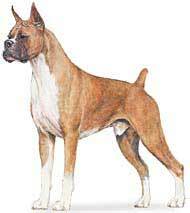 The Boxer was developed in Germany in the late 19th century, a cross between the now extinct Bullenbeiser and English Bulldog  hence their stocky, muscular appearance. Standard coloring for Boxers is fawn, red, or brindle with or without white markings (flash), although white Boxers are not uncommon. They have a short, tight-fitting coat, most have docked tails, and ears are usually floppy. However, cropping of the ears is still done for showdogs. As a breed, the Boxer is a very loyal, intelligent and fun-loving family dog...BUT not every dog is right for every family! There are traits in a Boxer that some find quirky and cute, whereas others may find...well, not so appealing. First off, Boxers are a breed full of love for people and a zest for life. 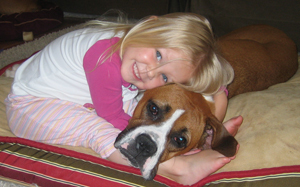 The Boxer can be an ideal family dog. Often described as the “clown,” of the dog community, Boxers are a class all their own. Those who own Boxers can attest to their unique characteristics. The Boxer is an extremely high-energy dog. As a result, they need a great deal of attention and supervision. Not a good choice for the couch potato who is looking for a lap dog (although the Boxer is very happy to sit on your lap if you let him. He’s totally unaware of his size, so be prepared to have a Boxer make himself at home in your lap!). Exercise is key to a happy Boxer and a happy owner! In doing so, he is less apt to get into mischief. Left to his own devices, a bored Boxer will invent his own games, such as “chew on the door frame” or “hide the remote control”. Like a toddler, they will find ways to occupy their time. Running along the same lines is the fact that the Boxer tends to be a stubborn breed  thankfully most are very food oriented so training with treats often works like a charm. Although they can be strong-willed they are also very trainable, and usually are happier for it. The Boxer owner definitely needs to be the alpha dog in the relationship. They will look to you for guidance, and consistency with training is a must! The Boxer is a “people-oriented” breed, they love nothing more than attaching themselves to your side like Velcro (forget going to the bathroom alone!) They are especially good with children although because of their sheer size and power monitoring your small child with a Boxer is always a good idea. Boxers should NEVER be outside dogs. One, because they are such “people dogs”. They will attempt to escape in order to find human contact. If not over a fence of considerable height then under! (watch this video of a Boxer scaling an 8-ft. fence!) Secondly, due to their short muzzles (brachiocephalic facial structure) they have the inability to regulate heat and humidity. Also, their short coats give them no protection from cold temperatures. If you’re looking for an outside dog  a Boxer is not for you! The combo of loose jowls and short muzzles are also responsible for snoring. This can range from little grunts and snorts to full on snoring. Now, did we mention the fact that Boxers are total clowns up until the age of about....oh, pretty much their whole life?! They are definitely “Peter Pans” of the dog world. Although they will mellow out in their old age, they are always up for fun and a little mischief! 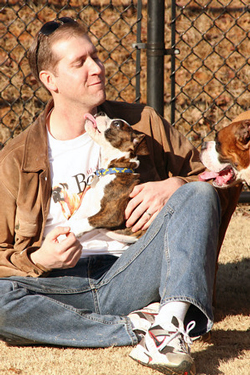 So, if you’re looking for a life long companion, devoted love and some good ol’ sloppy Boxer kisses look no further!